Thinning hair can be attributed by a number of different factors and causes. It can be very bothersome if it comes together with itchy scalp. And if you scratch it a lot, this can make the problem get worse. Depending on the cause of the problem, many times thinning of hair with itchy scalp is usually temporary. It is actually a skin condition, and it is quite common. But it can affect the skin of your head (scalp), causing grey /white flakes of dead skin in the hair or scalp. Dandruff and hair loss (including for thinning of hair) don’t share the same cause. Again, dandruff is a skin problem. And thinning hair is a kind of hair loss. Interestingly, you are also likely to lose some of dandruff as you lose your hair. Furthermore, excess dandruff can lead to dry, itchy scalp. And if you often scratch it, this may cause more hair follicles to fall out, causing thinning hair. Dandruff can vary from person to person (from mild to severe). The good news, it is harmless and not contagious. It is not associated with serious health condition or poses a threat to your health. But it can be very bothersome and embarrassing. The underlying cause of dandruff is not fully understood yet. But there are some theories that may help you to understand about it. Normally, your body continuously sheds dead skin cells. These old cells are replaced by new skin cells in order to maintain the health of your skin. This natural mechanism runs gradually, mostly you don’t notice it! But due to some reasons, this mechanism can speed up. This causes a rapid production of excess dead skin cells. As a result, you may have more dandruff. The affected skin can be itchy. Lesion and redness on the affected skin. The problem can make the skin become greasier than before. In severe cases, seborrheic dermatitis on the scalp may lead to serious patches and significant hair loss. But the complete remission of hair growth is probable, particularly if there is no scarring. Most of hair loss treatments are used topically. While this is good to treat the problem locally, but it may directly affect the scalp area where the treatment is topically applied. And one of possible side effects is more dandruff. For instance, the use of minoxidil (a common topical solution for male pattern baldness) may cause dandruff-like flaking as a side effect. The underlying cause may be alcohol of the treatment that can dry out the scalp. If you do find more dandruff from minoxidil, switching to another treatment may be your option. Another idea, you can take dandruff shampoo. Or if the problem is really bad, ask your dermatologist for a prescription steroid cream. Propecia (finasteride) is another hair loss treatment, doesn’t lead to flaking. Even many times it works better than minoxidil. Sometimes malassezia (fungus) that naturally lives on the scalp can grow out of control, causing rapidly new skin production and more dead skin cells. Both poor washing and too much shampooing your hair! While poor washing can cause more accumulation of dirt or other bad things in the scalp, too much shampooing can cause irritation. Excessive use of hair products such as hair gel, hairspray, or hair mousse. 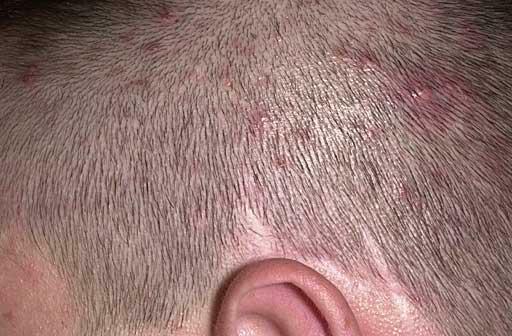 Psoriasis may also contribute to cause more dandruff, since it can make the scalp become dry and flaky. Environmental factors, such as extreme temperatures (both too dry and too cold climates). Lifestyle factors, such as stress and obesity. Without known reason, weakened immune system and neurological conditions may also have an effect. In fact, dandruff is also quite common in people with HIV /AIDS, Parkinson’s disease, and stroke. The cause of the problem plays a key role in the treatment. If it is linked to particular condition (such as eczema, psoriasis, autoimmune disorders, or neurological condition), addressing this underlying cause is necessary. For instances, if your dandruff is associated with seborrheic dermatitis, a prescription lotion /cream containing ketoconazole is usually recommended. And if your dandruff is a side effect of particular medication you’re taking, consider switching! Wash your hair and scalp appropriately, NOT too much and NOT too rare! This can vary from person to person. Use a mild shampoo to help get rid of dandruff, ‘tea tree oil’ shampoo may work best for you! Apply the shampoo gently, avoid scratching your scalp! Keep nails trimmed short! The use of hair products such as gel and hairspray should be avoided, at least until your dandruff clears! Stress can worsen everything. Many times, it is inevitable. But you can control it! Keep active and spend more time outside! It’s thought that getting adequate exposure to the sun (spending time outdoors) can help ease the problem. But don’t forget to wear sunscreen for your skin protection! Take anti-dandruff shampoo if necessary! If your dandruff is getting worse, the use of anti-dandruff shampoo can be worth a try! You can purchase it in your local pharmacist or supermarket. Salicylic acid, this essential acid can help soften and clear dead skin cells on the scalp. But it may make your scalp dry out. Therefore you may need to use it with a conditioner to minimize the side effect. Ketoconazole, which is usually required to help fight against fungal infection. Zinc pyrithione, to help fight against malassezia (a fungi that can trigger excess dandruff on the scalp, as noted before). Coal tar, to help slow and reduce the production of dead skin cells. Selenium sulfide, to reduce excess production of skin cells. It can help kill fungi, too. In addition, there is also opinion that eating certain foods contribute to cause more dandruff. However this issue is not clear yet. But if you do suffer from a food allergy, keep it off! Excess dandruff is not the only one. Thinning hair and itchy scalp may also be attributed by other underlying causes. It causes patchy of thinning hair or baldness, about the size of a large coin. It usually starts with 1 or more round, coin-sized patches. The patchy hair loss is usually noticeable on the scalp of the head, but it can occur anywhere in the body. But there is usually no pain and redness, because the inflammation mainly occurs in the deep of the skin, on the roots of hair follicles. Nevertheless, some people find that the affected area can be painful and itchy to touch at the onset of alopecia areata development. In some cases, the problem may also affect toenails and fingernails, causing tiny pinpoint dents. Sometimes the affected nails may change in shape or even fall off. The severity of the problem can vary. For instance, it may develop to a more severe form of hair loss such as causing no scalp hair (alopecia totalis) or no hair both on the scalp & body (alopecia universalis). It can occur in people of all ages. But it is likely to be found in childhood and young adults. In general, experts tend to blame a disorder in the body immune system. In fact, it is more common in people with autoimmune disorders such as Down’s syndrome, hyperthyroidism (over active thyroid), and type-1 diabetes. 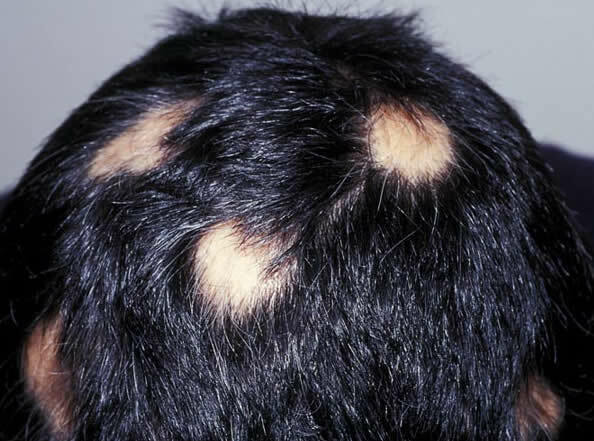 And interestingly, it is quite common in people with families of the same condition (though it’s not clear yet whether this alopecia is hereditary)! However this suggests that some people’s genes may contribute to put them more susceptible to develop it. Typically, it will re-grow in a few months. Even some people find that it grows back on its own. 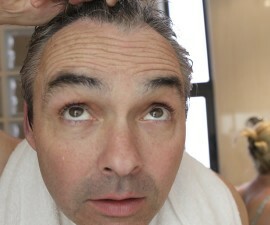 Interestingly, sometimes new hair loss can occur even with treatment. It seems that the outlook is closely dependent on how the immune system reacts. Medications to help suppress the body immune system. The use of corticosteroids is often the first treatment tried. The treatment can be taken through pill (orally), cream /lotion /ointment (topically), or given as shots. Minoxidil, a topical solution, can help stimulate hair growth. But it may be less effective than corticosteroids since it doesn’t target the underlying cause. Other treatments are with diphencyprone (DPCP) and anthralin. Both are topical treatments and can target immune system. Many times, the problem is often treated by more than one treatment. This is intended to boost the successful rate in treating alopecia areata. It is a common skin problem in which the inflammation occurs in some hair follicles. It can occur in any hairy skin, including scalp. At first, it may look like red, white-headed pimples with a hair shaft in the center of each one. These pimples usually contain pus, easier to break. If they break, they may drain blood, pus, or both. The clusters of these pimples may lead to red, tenderness, itchy, and inflamed skin. They can spread, and therefore it’s important to NOT scratch them! Although folliculitis is harmless, but it can be very bothersome and embarrassing! Even if it has caused scarring, hair follicles are less likely to grow back – and you may have permanent hair loss. The cause is usually infection due to fungus or bacteria. Staphylococcus aureus is a common bacterium that can lead to folliculitis. In some cases, the problem can be caused by viral infection, too – or even an inflammation due to ingrown hairs. Skin injuries, such as from surgical wounds and scrapes. If you have any conditions that can make you easier for skin infection such as dermatitis, diabetes, and some autoimmune disorders (weakened immune conditions). Tight friction from tight clothing or shaving. Heat & sweat, like when you wear waders or rubber gloves. Or side effect of some medications – such as the use of antibiotic therapy for acne in long term, and steroid creams. Apply a warm, compress or moist washcloth! If necessary, dampen with a saltwater solution (2 cups of water containing 1 teaspoon of table salt). This may help the affected area drain and ease the discomfort. Do it several times a day! An over-the-counter hydrocortisone cream or oatmeal lotion may help, too. This soothing solution can help relieve itchy skin. You can purchase it in your local pharmacist store. Since the problem is often caused by bacterial infection, try an over-the-counter antibiotic to help fight the infection. There are some options to choose from. These include washes, gels, and creams. Clean the affected skin carefully! Do it gently twice a day, and use antibacterial soap! Don’t share your washcloths and towels, since the bacterial infection is contagious. Use soapy, hot water if you need to wash these items. Wash any clothing that has contacted with the affected area! Avoid shaving and protect your skin! If you need to shave, use warm water to rinse your skin and apply moisturizer afterward in order to prevent the problem from spreading to other parts of the body. And use an electric razor! A number of different pills, creams, or shampoos for different purposes – such as to help fight bacterial infection or fungal infection, and to reduce the inflammation. Other medical interventions such as a minor surgery, laser treatment, and photodynamic therapy (a light therapy with medicated cream).